Nobody wants to spend long periods of time without a car, and it can be inconvenient to have your vehicle in the shop, meaning you have to beg for lifts or spend cash on taxis. Unfortunately, when you damage the body of your car, whether it’s a knock from parking or a full-on collision, your car will probably need to go to a panel beater to get your car back to normal. Because collisions often involve dealing with insurers, both for you and the other party, and mean you need to get quotes for the work, this can mean a lot of time chasing people by phone. Luckily, there are ways to make the process quicker, so you can be back behind the wheel in no time. One of the biggest delays for getting repair work done can be dealing with insurance companies. So, if it’s a smaller job, for example you’ve hit a post while parking, then paying privately can make life easier. Check your insurance documents and look at your excess. Sometimes it’s cheaper to pay out of pocket rather than pay the excess. Get a quote from panel beaters in Perth so you can decide whether to claim through your insurance, or pay yourself. Another issue to think about is your no claims bonus. If you make a claim for repairs, then your insurance can be more expensive when you renew, and with car insurance rates on the rise, this could mean a significant amount of money over the next few years. Therefore, you should weigh up the pros and cons before you go. The best way to sort out insurance paperwork? Let the panel beaters do it for you. Choose a company that’s used to dealing with insurance claims and they can take the stress out of the entire process. Part of the claims process that can cause delays is getting it assessed by the insurance company. There’s not much that can be done about this, as it varies by insurer and whether they’re busy at the time, but by making sure you use a reputable panel beater they can ensure all the paperwork is in place so work can be carried out as quickly as possible. Choosing an experienced panel beater is key to getting the best service. Plenty of companies make promises about offering the quickest service in your area, but if they’re not experienced and established, then they might struggle to work with insurance companies and get things turned around in time. Quality is also very important. When you are looking for panel beaters in Osborne Park, you want to know that the job will be done correctly the first-time round. Getting the work done professionally the first time will save you having to bring the car back later, and using an established company will take the stress out of the process. It often saves time if a panel beater can pick up the car, as you don’t need to go out of your way to drop your car off and try to get home. If you are stuck by the side of the road, your car can be towed, and you can be dropped off in a convenient location such as your home or workplace so you can get on with your day. It’s important that the correct parts be used to repair your car, and this can mean parts needing to be ordered. If you have a pretty standard car and there are lots of them on the road, then the odds are the parts will be easy to find. If you have a more exotic, foreign car, then this can delay things. Using a reputable panel beater means that they’ll know the best places to look for parts, which can help minimise the delay. When you claim on your insurance, it’s important that manufacturer approved parts are used on your car, as this ensures safety and high standards. If you go to a less reputable repair centre, they may rush to do the job using incorrect parts, which can lead to issues with your insurance, and mean issues have to be rectified down the line, which is a waste of your time. The time it takes for a job to be carried out will often depend on how much damage has been done. 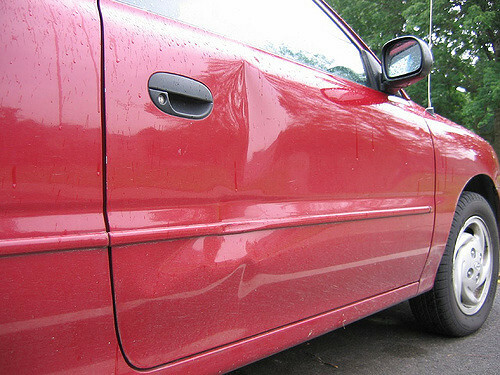 Some body repairs are cosmetic, which means dents simply need to be removed and panels can be resprayed. However, if you’ve damaged your suspension or other parts of your vehicle, then this can mean additional time to get the job done, and it may make the insurance process more complex. In these situations, using an experienced panel beater is essential, as they can explain the extent of the damage to the insurance assessor, and justify the cost of the repairs. It’s important that quotes are prepared for the insurance assessor, as this can help move your claim along more quickly. Having an accident can mean spending time without your car, which is inconvenient for the majority of people, and that’s why it’s important that body repairs get carried out quickly. By choosing a reputable panel beater, experienced with insurance claims, the process can be much easier. It means you don’t have to deal with your insurance companies, sort out visits from assessors, or do any of the tedious paperwork, you can simply sit back and relax while your car is repaired. If you’ve been involved in an accident in Perth and need a quick vehicle repair, contact K&W Panel Beaters today by texting or calling 0408-927-165.